LEARN HOW TO COMBAT YOUR PHOBIA OF SPIDERS WITH HYPNOSIS!!! Hypnosis is just the cure for the many people who have a fear of spiders. Arachnophobia, the clinical name for this phobia, is even the stuff that horror movies are made of, so it is no wonder that there would be a large number of people trying to over come their fear. Most spiders are relatively harmless to human beings, so the fear of spiders is often just a state of mind. This is the perfect type of phobia for which hypnosis is quite effective, because hypnosis is able to replace an irrational fear with a more realistic way of thinking. Most children do not fear spiders – perhaps because no one has told them that this creature the size of their fingernail is anything to be afraid of. So why is it that as an adult one may become afraid? It could be the power of suggestion or an increased awareness that there are things in the wild that can harm people. Perhaps Hollywood has done an effective job at scaring people through sensational movies. The reasons may be different from one person to the next. However, the treatments are generally the same. Hypnosis can help you overcome a fear of spiders by exploring the subconscious reasons for your fear. It does this by first getting you into a relaxed state. Once there, suggestive powers take over and hypnosis changes the way you view this external fear, internally. Dr. Steve G. Jones M.Ed. is a clinical hypnotherapist that has helped hundreds of people overcome specific fears. 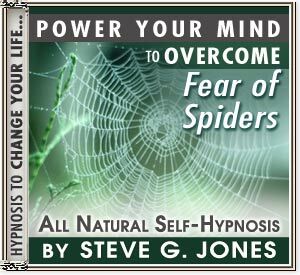 His program, Overcome Fear of Spiders, will help you determine the root of your fears. Only then can you but them aside and get on with your life. take charge of YOUR LIFE!!!! !.